The Hale-Bopp comet was discovered on 23 July 1995 by two American amateur astronomers: Alan Hale, in New Mexico, and Thomas Bopp, in Arizona. Chance had it that both astronomers were observing the M70 star cluster which the comet was close to, at almost the same time! Both of them noticed a blurred spot that corresponded to no known object. They both sent the information to Brian Mardsen at the Central Bureau for Astronomical Telegrams. Less than 12 hours after the first observation, the discovery of Hale-Bopp was announced to the scientific community. The Hale-Bopp comet passed relatively far from the Earth, but it was a particularly large comet. It was several tens of kilometres in size, whereas comets are rarely larger than 4 kilometres. It provided a splendid show to naked eye observers during the March 1997 nights. 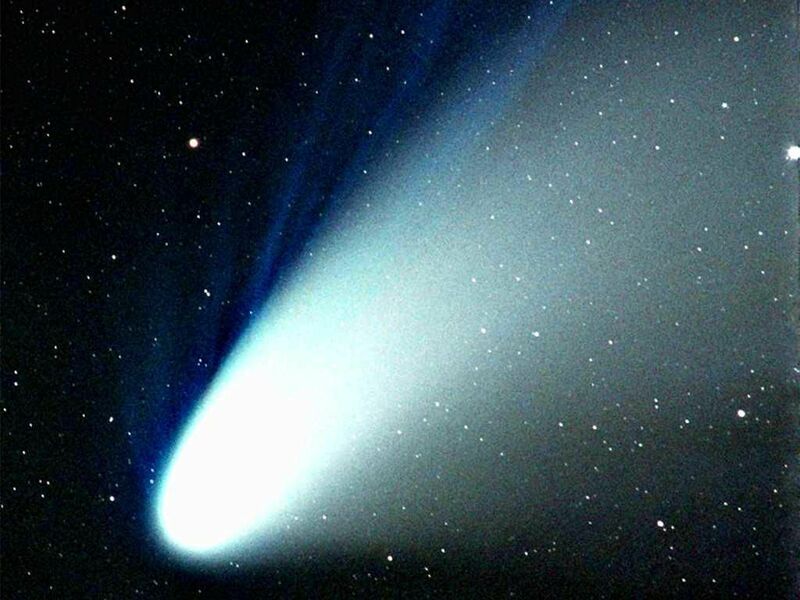 When it passed close to the Earth in 1997, observations showed jets of dust escaping from the Hale-Bopp comet. The Hale-Bopp comet, credits DR.